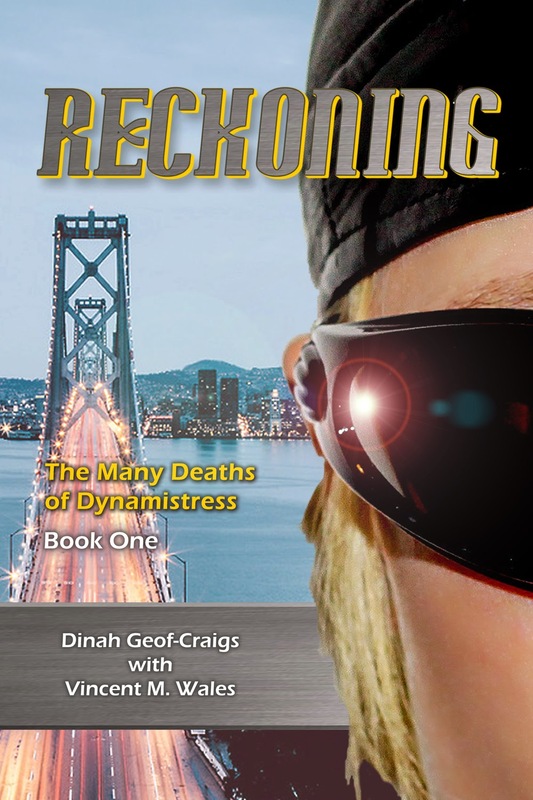 Straight from the Library: Straight Chatting From the Library: Dinah Geof-Graigs from "Reckoning"
Straight Chatting From the Library: Dinah Geof-Graigs from "Reckoning"
This post is part of a virtual book tour organized by Goddess Fish Promotions. Enter the Rafflecopter below to win a $25 Amazon GC. Click on the tour banner to see the other stops on the tour. Wow. That’s really hard to narrow down. I hate to admit this, but I haven’t done very much reading for pleasure in many, many years. Most of what I read are scientific journals. But I’d have to say my favorite novel is Still Life With Woodpecker, by Tom Robbins. Some seriously fun and funny stuff, and there’s one sentence that still can make me laugh until I cry. So why a book series about you? Beats me! I thought the idea was ludicrous. But people seem to be enjoying it. Maybe it’s because I’m the first verified case of gaining meta-abilities by way of direct genetic manipulation. Maybe it’s because of the scandal surrounding my self-experimentation. Or maybe it’s because of my involvement in The Nevada Incident. Yeah, probably that. Do you think books about superhumans will become as popular as the movies? Anything is possible, but I doubt it. The movies are big, flashy stories, filled with action and tremendous bad guys. But the real deal is something altogether different, and not very cinematic. We’re like the police, in some ways. Lots of boredom punctuated by episodes of sheer terror. Believe me, my life is nothing like the movies, which I guess is why you’ve got me in memoir form, rather than on the big screen. And if you ever did make it to the big screen, who should portray you? My brother is adamant that it should be Naomi Watts. I don’t particularly see the resemblance, but I’ll take his word for it. And we’re close to the same age, so that works out nicely. What’s the worst injury you’ve sustained on the job? Most of my body was covered in very painful and, in some cases, oozing blisters. I had a broken rib, and it punctured a lung. Yeah, I think that was worse than when I had a spear chucked through my midsection. Hey, thanks for putting those memories in my head! The chapters of your book all begin with quotes from famous people. Do you have a favorite quote? I seriously could not pick just one, but I can give you one that is a new favorite. Muhammad Ali said, “The man who views the world at fifty the same as he did at twenty has wasted thirty years of his life.” I think one of the hardest things for some people to grasp is the idea that they won’t always have the same beliefs and opinions. So when they get older and they do change, it always comes as such a shock. What’s an example of how you’ve changed? Truth is, from the time I was in my late teens until I was in my thirties, I was a sorry excuse for a human being. I was spiteful, selfish, and angry. I blamed others for things beyond their control, held ridiculous grudges, and shut out people who’d once been close to me. Changing into a better person – or, as my brother says, changing back into the person I was before – wasn’t all that difficult. Accepting that I was that person to begin with was the hard part. So why did you become a superhero? First, I really don’t like that term. I don’t consider myself a hero. But your question is one that shows the irony of my situation, because I didn’t pursue this path because of nobility or whatever. As I said, I was a pretty despicable person. And somewhat shallow, too. I chose this path because I wanted to be famous. I wanted my face on magazines. I wanted the product endorsements. Today, I’m ashamed of that. I’m a lot more humble now. I know my limitations. I know the world doesn’t revolve around me. To my mind, that makes me a lot better at what I do than I otherwise would have been. There is much disagreement about when super-powered metahumans began to appear. Most scientists believe the first births were in the '40s, perhaps the '30s, although there is a small (but vocal) minority claiming they have always been among us. More than anything else, young Dinah Geof-Craigs wanted to be one of them, to be famous, to be on the cover of Supers magazine. But puberty came and went without the meta-mutation that would imbue her with superhuman abilities. Mother Nature had cheated her of what she deserved. And that would simply not do. In Reckoning - the first volume of a trilogy about the metahuman known as Dynamistress - award-winning author Vincent M. Wales (Wish You Were Here, One Nation Under God) gives us the memoir of the world's first self-made metahuman. But it is less a story of becoming a superhero than it is the story of a flawed woman becoming whole. I had never been very studious in high school. My grades had always been decent, and I’d always enjoyed learning, but even in the late ‘80s, I knew the schools weren’t concentrating on things that really mattered. Seriously, why does anyone need to know what our Gross National Product is, or the major imports and exports of Brazil? I will, however, defend one practice that a lot of people don’t seem to understand. Why, they lament, when kids today all have computers, are we still filling their heads with advanced mathematics? It’s simply not necessary, they claim, to teach them how to do calculus. But they’re wrong. If we stopped teaching it, we’d never advance. No one would be able to take math in new directions. Memorizing the terms of office of all the U.S. presidents, however, will always be pointless. At any rate, I think my professors were a bit astounded. After all, for these first two years, I was taking just the basics in biology. But after class, I’d pick their brains about the latest things. The automated gene sequencer had been invented recently, and I had all sorts of questions about that. There was talk about a Human Genome Project soon to be beginning, and I asked almost daily if they’d heard anything new about it. I badgered them about the finer points of the regulation of gene expression. And I think they got tired of my incessant questioning about point mutations. But I didn’t much care if others thought I was odd. It was the life I wanted, at that point… working on weekends, spending weekdays in classes taking as many credits as allowed, and passing my nights by avoiding home as much as possible. I was in my own little world, avoiding my family, and becoming estranged from those I used to call friends. Talk about establishing a bad precedent. Vincent M. Wales was raised in the small town of Brockway, Pennsylvania, where he frequently complained about the weather. Since then, he has worn many hats, including writing instructor, suicide prevention crisis counselor, essayist, Big Brother, freethought activist, wannabe rock star, and award-winning novelist. He currently lives in Sacramento, California, where he frequently complains about the weather. Thanks for the interview! It was fun! It's a good one, isn't it? And so true. Thanks, Virginia, and good luck!